No more rummaging around in your gear bag when you need a cable to charge or sync your Android or iOS devices, as it’ll soon be possible to have a charging cable at arm’s length — literally. Infinity Links has launched the new version of its charging cable bracelet and its sleeker than ever! We’ve all been in the situation where you forget to bring a cable along with you or simply forget to charge your phone — Wave by Infinity Links is a bracelet that aims to solve that problem. Combining the best technology and craftsmanship, these fine leather accessories are both practical and stylish. Infinity Links’ bracelet charger encases a USB-C/Micro USB or an iPhone Lightning Port with a magnetic clasp and it comes in five color choices: black, white, blue, brown, or pink. Wave can be used to both charge and sync your devices. Its braided leather is crafted to be extremely durable, too. Infinity Links has built this luxury charging cable bracelet from the ground up with design and functionality in mind. 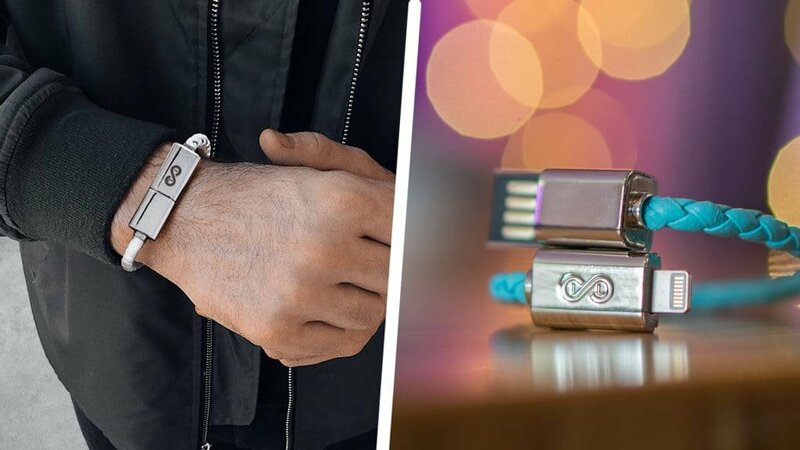 To use the bracelet, pull the magnetic clasp to reveal the USB charger with either USB-C, Micro-USB, or Lightning port. Then plug it into a socket or charging device and watch the magic happen! Once you’re done with it, place the charger back into the slot and wear it on your wrist — it’s that simple. Offered in 5 different colors with 3 different sizes — either small, large or a double loop — the Wave USB Charging Bracelet by Infinity Links is currently on sale for $28.00 and is available via an Indiegogo campaign. It’s a great product for those in the market for either a luxury bracelet or a portable charging cable — it’s the best of both worlds.